Travel back to the time of Hercules, an ancient Greek hero as he embarks on a great adventure to rescue his kidnapped wife from the clutches of Hades the ancient god of the underworld. On the way encounter a vast cast of fellow heroes who will help you battle beasts, find artifacts, work your way through obstacles, and more! Install now and play in your choice of: English, French, German, Russian, Japanese or Polish. 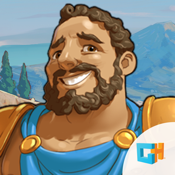 This time management adventure will keep you hooked as you guide Hercules through ancient Greek landscapes presented in a colorful comic book style. Will you be able to rescue Hercules’ wife and banish Hades back to the underworld from whence he came! Try it for free then unlock the full story in-game. -Classic time management game play set in ancient Greece. -Enjoy the adventure in stunning HD retina graphics! -Play through the story in relaxed or expert mode.